Balkan Youth Festival took place in Macedonia from 26.06.2018 to 01.07.2018.Although several Balkan Federations announced their attendance, only participants from Slovenia, Croatia and Macedonia took part. 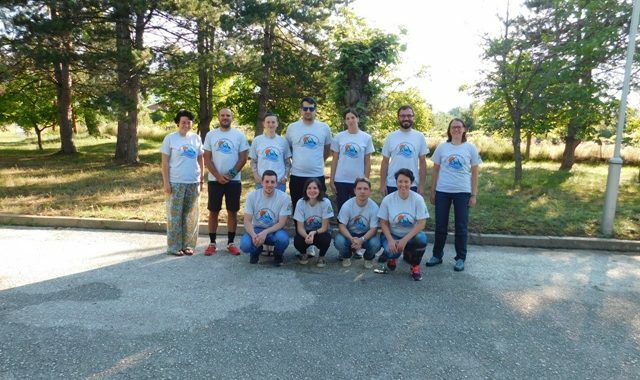 There were 3 participants from Slovenia, 3 from Croatia, 3 from Macedonia, and 3 additional helpers also from Macedonia, total of 12 participants. The festival took place on several locations in Macedonia. The Youth Commission, the newly formed one,had the responsibility to organize this event and managed to realize the scheduled plan. 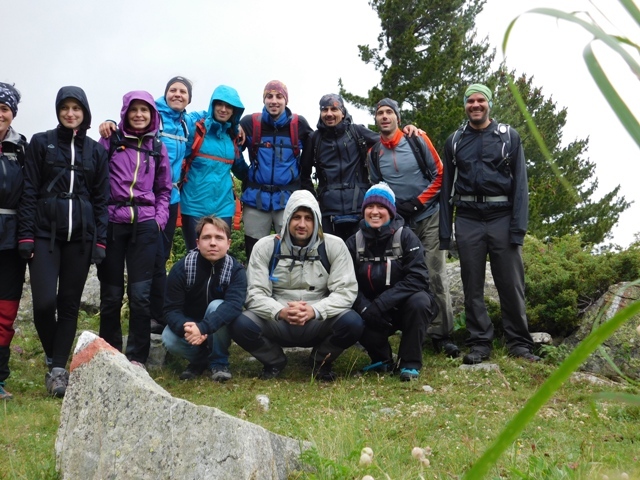 The goal of the festival was the interchange of information while working with young hikers, having a good time, mountaineering, information about the way how the Balkan Youth commissions function etc. According to the program,estimated time for gathering the participants in Skopje was Tuesday from 12:00 AM to 17:00. Participants from Slovenia and Croatia arrived at scheduled time (16:00), with mutual vehicle from the Slovenian Mountain Association. After their arrival in Skopje, we visited the premises of the Macedonian Mountain Sport Federatio, where we had a short meeting, the participants were acquented with the rectified programme and we were ready for the sightseeing tour of Skopje. According to the program, we were supposed to visitthe canyon of Matka, butbecause their journey to Macedonia was very long we decided that they should have a Skopjesightseeing tour. The weather was not so good, it was gloomy and rainy , but we managed to have a walk through Skopje. After short coffee break on the banks of the river Vardar, we went to the premises of the MMSF (Macedonian Mountain Sport Federation), around 20:00we headed to canyon of Matka. 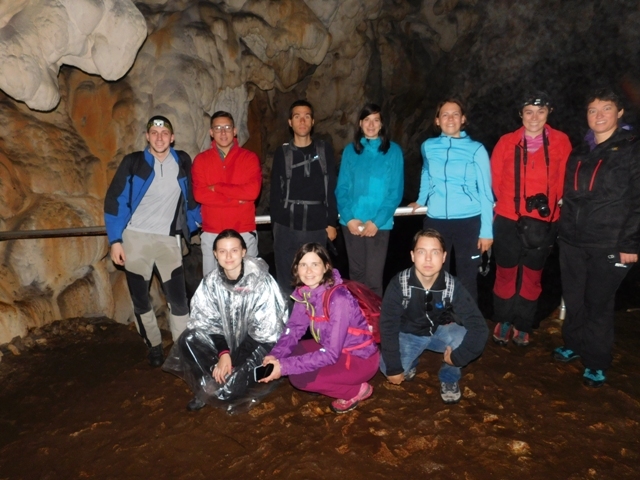 The participants spent the night in the Matka mountain hut. After the dinner we had a short discussion about the flexibility of the program depending on the weather conditions. Because they travelled a long way, after the discussion the gueasthad short res, while the participants from Macedonia had a short meeting. According to the program, were supposed to climb to the monastery “St. Nicolas Shishevski”. The monastery is located at the other side of the canyon Matka. After the breakfast, one more member from the Youth Commission, Mario Sarevski, and a member of the cave diving club “Vrelo” and the president of the Rescue Commission, KireAngeleski joined us. It was raining all the time and the descend on the tiny rocky terrain was too risky and after the consultation with the guests, we decidedto change this part of the program and to take the trail which leads towards the cave “Vrelo”, and on the halfwaythe Resque Commission President was supposed to pick us up by boat. After 15 minutes of walking, we came by the lake and by boat, owned by the cave diving club “Vrelo”we reached the cave “Vrelo”. Because of the rain there were no tourists there was no light in the cave and we used our headlights. We had a short sightseeing tour of the cave and went to a hut several minutes distance from the cave owned by the diving club. It was the only way to reach the hut. In spite of the rain, we made a campfire. The Resque Commission President had a presentation about theunderwater examinations they have done in the cave “Vrelo”, its interesting sights, its depth etc. We spent the time by the fire, playing guitar and harmonica. We heard the hymn of the Youth Commission of Slovenia for the first time. At 13:00 we went back to the mountain hut Matka where enjoyed the lunchand we were ready for our next destination. Because of the bad weather conditions, we cancelled our visit to Prilep and Zlatovrv and we headed towards the archeological site Stobi. In spite of the rain, we managed to have a walk through the site and to make some pictures. After Stobi, we went to the climbing site of DemirKapija,. It was late afternoon and we had a long way to the hotel in Krani, by the Prespa Lake,sowe canceled our trip to Prilep again. We arrived at the hotel at 21:00 where we had dinner. After the dinner, we had a discussion about the program for the next day. Because the weather forecast was bad for the next day, we cancelled our climb to the summit of Pelister, i.e. we postponed it for the day after and, as an alternative, we decided to have a walk through the city of Ohrid and its surrounding. Around 9am next morning, after the breakfast, we headed towardsthe city ofOhrid, where we visited theplaces of interest: Old Town, Samuil Fortress, Plaoshnik. We had a walk through downtownOhrid, where the guests found interesting the souvenir shops. We went to the famous souvenir shop “Filevi” where the owners of the shop, presented part of their longtime work, as well as the famous crafting of the Ohrid pearl. After the coffee break, the group visited The Bay of Bones and St.Naum. Because the weather conditions were bad again, we had a short sightseeing tourofSaint Naum museumand we went back to the hotel. Another member of the Youth Commission joined the group in the evening, Andrej Bandovski. After the dinner, we had a party and a short discussion. The Pelister hikingtour next day was pending. Hiking to Pelister was postponedagain because of the bad weather conditions so, after the breakfast at 05:00 AM, we visited the city of Bitola. 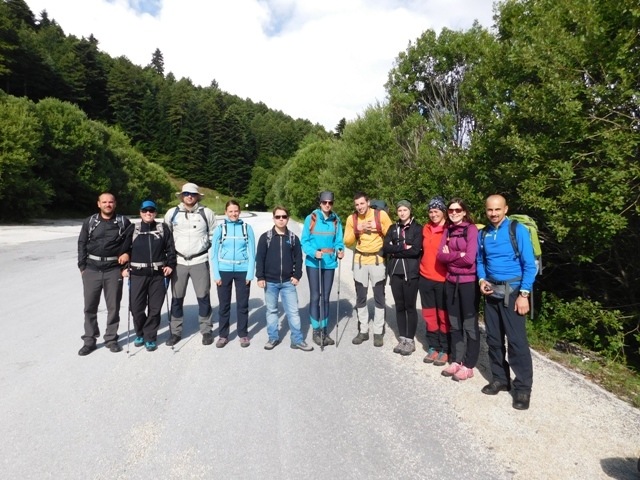 Two more mountaineers from Bitola joined us on this hiking tour, the licensed mountain guideVlatkoGrozdanovski, accompanied with his brother. At the beginning the weather was sunny. We decided to take “Shiroka” trail, and then to go to the place called “Bolnici”. The plan was that if there were no clouds around the peak, and the stony terrain was dry, to go to the peak, but if the weather conditions were not good, to go to altitude of 2000 meters and to go back. We had several alternative trails. We started around 08:30 and after 3 hours of hiking, we reached the altitude of 1900 meters. 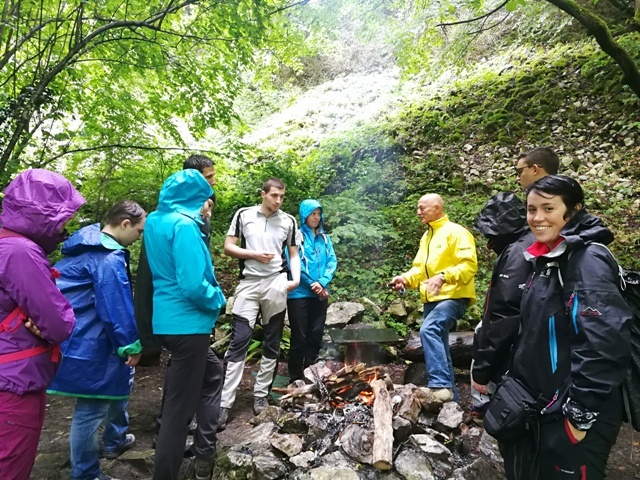 Because the weather conditions were bad again, we decided to go back and to have a walk through the National Park “Pelister” and to the mountain hut “Kopanki”. We visited the archeological site of Heraclea in Bitola. We had a short sightseeing tour in Bitola, and after the coffee break we went to the hotel. AleksandarStojanovski, another member of the Youth Commission joined us in the evening. We decided to have a party in the evening, because the hiking tour for the next day, climbing of the peak Magaro, was an easy and short tour. At the beginning, the guests wanted to learn the traditional Macedonian dances, and later, to present their own traditional dances. The participants of Slovenia performed their traditional dances, called “banses”. The bans is a dance in which the participants sing and dance. The students from the Pharmaceutical Faculty in Skopje, guests in the same hotel, joinedus dancing the banses. The party lasted until late in the evening. The last day of the festival. All of the participantswanted to take advance of the nice weather. The day was wonderful, the weather conditions excellent. We headed towards the peak of Magaro. The climbingtook us 2 hours.During the breaks we danced the Slovenian traditional dance. We spent 2 hours on the peak enjoying the wonderful view of the Ohrid Lakeand taking photos. On our way down, we were singing the hymn of the Youth Commission of Slovenia – “Greva pod Objem Gora”. After the break, we visited the village of Stenje, on the Prespa Lake. The beach was almost empty. Some of the participants were swimming in the lake, some were playing volleyball on the beach. After the sunset,we had dinner at the hotel.and the discussion session.The participants of Macedonia presented the past and future activities.The participants from Slovenia presented the work of the Youth Commission. 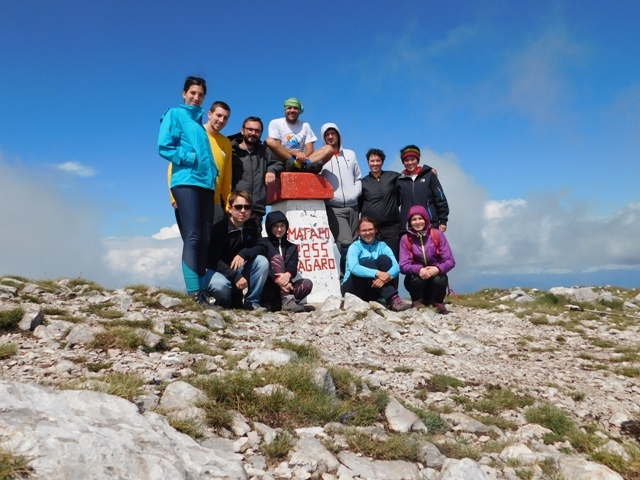 NoYouth Commission in the frame of the Croatian Mountain Federation. We had an agreement this festival to became a traditional one and with more participants. All the participants agreed that in the upcoming period we have to make a working plan with the young hikers from all over the Balkans and to make a memorandum of collaboration. We spend the last day travelling and making mutual photos. Because the participants from Slovenia and Croatia had a long way ahead (12 hours of driving), after the breakfast we headed towards Skopje. We helped them to pack their belongings, and before we say goodbye, we danced the Slovenian traditional dance. In spite of the bad weather conditions, all went well. The alternative plans were completely realized. The places that we didn’t visit and which were in the original plan were: Treskavec near Prilep, the villages of Brajcino andLjubojno and the Pelister peak.